I apologize for being later than my official “sign-up” week in posting a full entry to the blog. It seems that my whole life is running about a month behind right now. But on the positive front, this has given me a chance to read all of your other posts, and to visit the links to the excellent outside resources you’ve all provided, and this has already introduced me to many ideas and lines of analysis that I’m finding interesting and useful. I’ll try to make a few connections to your points that resonated with me as I write my full post below. 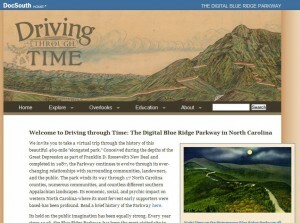 One thing reading the blog so far has made me realize, too, is that there are probably a lot of things I (and the people I have been working with) should have known and thought about—as a team, together—before launching head-on into creating Driving Through Time: The Digital Blue Ridge Parkway, my own “digital humanities” / historical visualization project that I want to reflect on here. As I thought back to those beginnings, and to what I needed to have known, I was especially struck by two of the posts by Sharon and Steve: Sharon’s survey of a number of examples of different arrangements and strategies for presenting collections, and Steve’s about the benefits and drawbacks of various collections management systems and the need for the data to be able to be freed, especially struck chords. I remember feeling when I started my own work that I needed more time for a systematic study of both interfaces and databases before we began so that we could select tools that best fit this particular material. But, alas, our project did not really build in time for that kind of learning – especially not in a coordinated, systematic process by the entire team (though, to be fair, several of the staff with whom I was working had previously done a good bit of this work). So, with the grant clock ticking, we plunged in with whatever varying degrees of knowledge we brought to the project. In the end, I confess that I really did not always understand the implications that many early technical decisions would have for our data and for the project’s usefulness, portability, and interpretive potential. But I am getting ahead of myself. Let me give a little background. 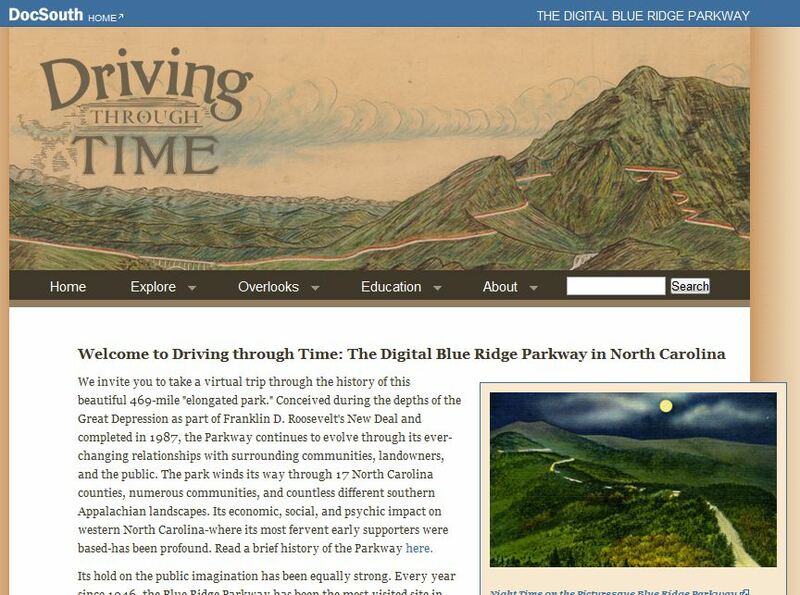 Driving Through Time: The Digital Blue Ridge Parkway, a large digital historical collection for which I have been the scholarly advisor since 2008, made its official debut in January of this year. It’s based on my 2006 UNC Press scholarly book, Super-Scenic Motorway: A Blue Ridge Parkway History, which was in turn based on my 1997 UNC History dissertation. I’ve been working on Parkway history since 1991! That whole aspect of one’s professional “positionality” (to employ some jargon) and the ability to do innovative scholarly projects is something I’d love to discuss, since I’m one of these “alt-ac” people who have been a topic of conversation in digital humanities circles of late. But what I wanted to take up here are some of the challenges and frustrations I found as a scholar whose expertise was the historical content, but who had enough interest in the digital revolution to realize the interpretive possibilities offered by computer-aided visualization. What I was able to imagine for the project originally, based on my own content-based sense of the “visual” possibilities of Blue Ridge Parkway historical materials and history (and my own very limited technical ability to implement anything at all). The distance between the original vision and what we were able to do, some key areas where I think we have not yet realized the vision, and some reflections on why. The possibilities for how to move this forward, especially given limited support for further interface development at the library. What do I need to know, and what forms do our data need to be in so they are as portable as possible? What other outlets (e.g. Viewshare or other tools) might ultimately allow this to grow and expand in a way that is both sustainable and flexible? First, what I wanted, and why. When writing my book, I was often frustrated by the fact that many of the important historical conflicts over the Blue Ridge Parkway (a 469-mile scenic highway between Shenandoah and Great Smoky Mountains national parks, built beginning in 1930s) were essentially spatial: they had to do with land acquisition, land use, travel routes, regional economic patterns, historical erasure and reinterpretation on the land, and the relationship of a national park road – a trip through a space – to all of the above. While writing a chapter on the scenic “Peaks of Otter” in Virginia, I realized how any point on the Parkway was a sort of palimpsest – a layered set of landscapes representing different historical moments. The construction of the national park represented the explicit creation of a “designed” tourist landscape on top of (and obliterating in many cases) evidence of previous communities, homes, and life patterns. All of this became quite problematic when the National Park Service started trying, after the late 1930s, to interpret histories of those now-vanished communities on (and by means of) its newly designed landscape. Trying to recount all of this in Chapter 6 of my book entangled me in a thicket of overlapping stories that were a challenge even for me to track. I kept thinking, as I was writing, that if I could only have a set of transparencies – sort of like those in books for children about the human body—that would allow me to overlay the “before” and “after” and thus show the changes and interpretive inaccuracies, it would be much easier for me and others to “see” what happened at this site. However, this was not going to be something my press was going to do in a book for which I had already exceeded the number of illustrations in my contract. So I had no alternative but to describe verbally a number of aspects of the story that could have been engaged through some visual means. Fast forward to 2008: in a move for which I will be forever grateful, colleagues at the University Libraries contacted me to see if there might be possibilities within the Blue Ridge Parkway materials to develop a digital project to add to the long-ongoing collection “Documenting the American South.” When they demonstrated what they had done to help visualize North Carolina’s urban history with geo-referenced overlays of Sanborn Fire Insurance Maps, and with related geo-tagged historical materials, as part of their “Going to the Show” project on moviegoing, I nearly cried. I knew that the Parkway’s historical archives contained more than enough maps that, if geo-referenced, could similarly convey the changing landscape of the 29 Virginia and North Carolina Parkway counties. I also knew that, like the maps, almost all of the other Blue Ridge Parkway archival materials (photographs in particular) had with them metadata about where they were taken. Together, I and my library colleagues devised and secured the funding for a plan for a geospatially enabled Blue Ridge Parkway archive that became Driving Through Time. Geo-referenced historical maps and drawings that could be layered both upon the present landscape and on each other, so as to see the evolution of plans over time (or, in several cases, plans not implemented vs plans implemented – getting at another of Steve’s points, the ability to demonstrate contingency in history and the very real possibility, at various decision points, of alternative outcomes). Geo-tagged historical resources (photos, maps, newspapers, oral histories, etc.) that could be searched via a Parkway map – allowing people to find materials based on location, the same way they navigate the Parkway itself. Some kind of visual environment or interface whereby a visitor could virtually drive the (historical) Parkway and encounter these materials. Something that would allow visualizing and searching materials simultaneously in space and time (e.g., what’s available for this site predating 1950?). Some created, interpretive maps that would, for instance, take historical data or information and allow visualization of historical dynamics with regard to the Parkway: for instance, a timeline-based map that would indicate the progression of Parkway construction over the 52 years it took to build (1935-1987), or some kind of interpretive map that would demonstrate what the Parkway would have looked like if a different decision about Parkway routing had been made during a huge 1934 conflict over this issue. These interpretive maps might have also interacted with the digitized historical materials, allowing a space-based discovery process related to the digital materials. I now realize that this agenda was probably far too ambitious for the time, personnel, and money we had available. Additionally, I realize that my wishes far outstripped my knowledge of what was technically possible or how it might be implemented. At one point, however, in an attempt to envision what the “main” site interface (which I had always envisioned as a MAP) might look like, I drew this picture, by hand, and shared it with my library colleagues. As you will see by visiting the site, we have done a tremendous amount of work and do have many of the features originally envisioned. I am very proud of what we do have: over 3500 digitized, geotagged items (photos, maps, oral histories, newspaper articles), several interpretive historical narratives (“overlooks”), about 100 geo-referenced maps that can be output to Google Earth, about a dozen K-12 lesson plans. Building this has taken a prodigious amount of thought and effort by a whole team of people, and it vastly expands the prospect that many publics interested in America’s most visited national park unit can engage its history. Yet, the “visualization” piece of this is not where I had hoped it would be. What we have seems closer to a spatially enhanced (note the “geobrowse” feature), but still somewhat conventional “digital archive” than I originally imagined, and much of our interpretive material (the “overlooks,” in particular) is more text-based than I had hoped. The simultaneous, dynamic time/space faceted browse is not really there (though you can search by both time and space), and we have not had the time, money, or staff resources to create new interpretive maps (or map-based “overlooks”) upon which to project historical materials. We don’t get as much of a sense of “driving” through the materials as I could imagine we might. Why? What were some roadblocks (to continue the driving metaphor) and difficulties we encountered, and some resulting limitations of the site? Previous models of digitization in our library’s collections were generally somewhat more static collections of carefully curated, digitized historical materials. While the scholarship underlying all the collections has been top-notch, the visualization models and tools we already had to work with here at UNC were perhaps more conventional combinations of scholarly interpretation and searchable primary sources that what has since become more available elsewhere. Turnover in library and student staff during the two years of grant funding cost us development time and continuity of vision. There was not enough money for programming support at times we needed it, especially toward the end of the project, when we were able to see issues, but not really make any changes. My time was always piled on top of my unrelated “regular job,” and at times I could not put in the sustained hours on research, writing, materials selection, and editing that were needed. Had I been a “real” faculty member, I might have been able to secure a scholarly leave to work on this undertaking, but, even had funding been available, my present job would not allow for a semester’s or year’s absence. Additionally, with the project built on soft money, most of the project staff was temporary and linked mainly to this project, lacking a longer historical memory and interconnection with ongoing library initiatives that would have helped inform and sustain this project. Changing library priorities and available support. During the course of my project, the library re-examined its commitment to building single-focus, grant-funded, interpretive digital projects and moved towards mass digitization of its collections. This left my project and others a bit “homeless” in terms of commitment to ongoing development, fundraising, etc. The university, meanwhile, has endured the recession and severe state budget crisis that has stretched every office (the library included) thin and put everyone in “retrenchment” mode. What IS “location”? What is “date”? While it was easy to say that all materials would be “located,” in practice it proved very hard to consistently represent location within a wide variety of (variously identified) historical materials. Is “location” a “milepost”? What about items that don’t have a “milepost”? Is location a county, town, geographic feature, parkway “section” (numbered sections that guided Parkway construction)? All of the above? Similar issues pertained with “date.” Year, month, decade, day? How to indicate the level of certainty one might have for any of this? Our database and our processes of developing metadata made these questions difficult to engage and resolve, and did not readily allow for items to have multiple “locations” or locations of different scale (ultimately, all of our “locations” link to a single point). As I learned midway through the project, database creation for historical materials is its own specialized area of practice; it would have benefitted us to have more input from a database architect familiar with the vagaries and inconsistencies of historical materials as we created our structure. Building a site infrastructure and interface from scratch. While Greg’s post and the Danish study to which Phil directed us both point to the growing trend in public history for institutions to develop collections within existing interfaces (e.g. Flickr) rather than building their own, and while Viewshare is providing a tool for that now, ours was custom-built. While this provided some advantages of creating database fields, search features, and a site look that pertain specifically to the Blue Ridge Parkway, it also meant spending a great deal of programming time on basic faceted search/browse functionalities that probably have [had already?] been standardized elsewhere. Furthermore, with only limited programming support and programmers who were not always well-versed in the larger landscape of historical visualizations, our ability to implement innovative features was sometimes limited. The question now is: is our database robust enough to allow feeding out to other interfaces as they are developed? Here is an example that Trevor put up of outputting our data to Viewshare – note that for reasons I don’t understand, but Trevor probably does, our images don’t feed here, but you have to go back to our site to see them. Various issues with handling maps, especially multi-part maps. For reasons I do not understand, part of our collection is in Django (a MySQL database) and part (the maps, as you see in this one) is in ContentDM. For various technical reasons, handling of the maps has had to be separated from the rest of the content. The process of geo-referencing and creating KMZ’s for output to Google Earth was laborious, and the library’s lack of a “map server” hinders greater development of this feature (though, honestly, I don’t really know what this means either). The decisions about these matters rested almost completely with the library, and I have only the barest understanding of the thinking behind them, although it’s clear that they do have implications for what we have done and can do. Much of the interface is beyond my/our control. Making any changes to a number of key pages requires calling upon staff in the Library Systems Department – technical colleagues who are already overwhelmed with other work and have no continuing mandate (or money) to support this project. For instance, I would like to have some more intuitive and logical presentation of the list of geo-referenced maps that we have – for instance, to call attention to two related sets of maps, the Parkway Land Acquisition Maps, and the Parkway Land Use Maps. But changing this page (because the list is generated from the database) requires the intervention of the overburdened Systems Department, something that cannot be requested frequently. Problems with search and thumbnails. It seems to me that a site like this should have a Google-like keyword search, but, as we describe here, it does not. Instead, it treats a multiple-word search as an exact phrase, and therefore returns no results at times when a casual user would expect it to find things. We discovered these problems with the search feature very late, however, after the funds for our dedicated programmer had run out. I have no idea why the search works this way, but there appears to be no short-term prospect of improving this, due to limitations of library staff. Similarly, I wish the “results” pages would return thumbnails of the related images, but they do not. I want to understand why, but cannot pressure the library to change this now either, especially since I have no idea what kind of work that would entail. So, what now? What I would like to receive from the working group is some input about where this project might go from here. How might we move ahead to more fully realize its potential? What, specifically, can I, as a technology-friendly scholar who has more ideas for the presentation of this content, but who has very limited power (or knowledge) myself to make any changes to the site, do to enhance its prospects for expansion and improved interface? How can I work most productively within the constraints of the library infrastructure were the collection now lives? What questions do I need to ask about the data, the database structure, and the underlying programming? What kinds of training or access do I need? What new tools are available that might be employed without a heavy burden for library technical staff, and what would I (or they) need to do or know to access them? Bottom line: helping with the creation of Driving Through Time has been a very rewarding process, and the site has dramatically improved access to some important collections of Parkway historical materials heretofore inaccessible to most publics. But if, as Trevor noted, and as Gloria Gonzalez (quoted in Trevor’s linked post on the Phay Collection at Ole Miss) said, “creating an interface is an exploratory and interpretive act,” how can the scholarly content expert, working now in a somewhat unfamiliar, collaborative environment, more meaningfully help shape the interface (as she might have shaped a text) to maximize a digital collection’s interpretive potential? This entry was posted in Uncategorized by amwhisnant. Bookmark the permalink. By day, Deputy Secretary of the Faculty, UNC-Chapel Hill. Also, Adjunct Associate Professor of History. Sometime National Park Service consultant. Blue Ridge Parkway expert. Always a historian. Thank you for this thorough reflective essay on an amazing project. “Driving through Time” is extremely impressive, attractive, and usable AND a doorway to a great trove of digitized material. But I get your frustration in having imagined fluidity of “driving” using layers of maps, documents, photographs and other primary sources to create an experience of place. I am about to embark on a Historic Preservation survey (a field work project involving as much technology as we can figure out how to use) of the East Tennessee marble industry, based on my recent dissertation. It will be a much simpler project, but a thematic geography like yours, and I ,too, have relied on maps for historical evidence for the research. Now I want to make more use of them plus make this project as alluring and alive as possible. As we survey the remaining physical traces of this almost disappeared industry, I will also be looking for ways to share our pulled together resources on the web (currently looking for models) and perhaps even capturing some of the process as we go. Look forward to talking with you all soon!